Most of us can't afford to have Tony Maserati mix our tracks — but thanks to Waves, we can now use his personal effects and processing chains in our own mixes. I have, on occasion, suggested that music technology software might be made easier to use if it was approached from the musician's point of view rather than the engineer's. 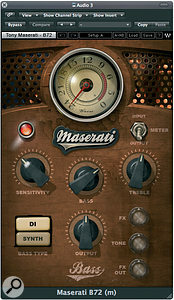 Waves have clearly taken steps in that direction with the Maserati suite of plug‑ins, developed in conjunction with award‑winning mixer Tony Maserati. Maserati has worked with artists as diverse as Black Eyed Peas, Beyonce, Alicia Keys, Macy Gray, Sting and David Bowie, and in March 2007's Inside Track feature (/sos/mar07/articles/maserati.htm), he talked to SOS about his work on John Legend's 'Save Room'. 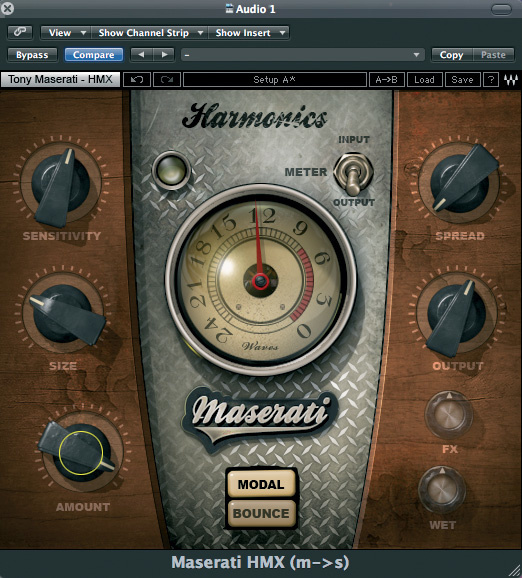 Tony Maserati has his own favourite signal‑processing chains for specific applications, and what Waves have done is recreate those chains in software, bringing out only those controls that Tony would normally adjust during a session and leaving the rest hidden. The result is that with just a handful of knobs and buttons, you can arrive at a highly produced guitar, bass, voice or drum sound very quickly. 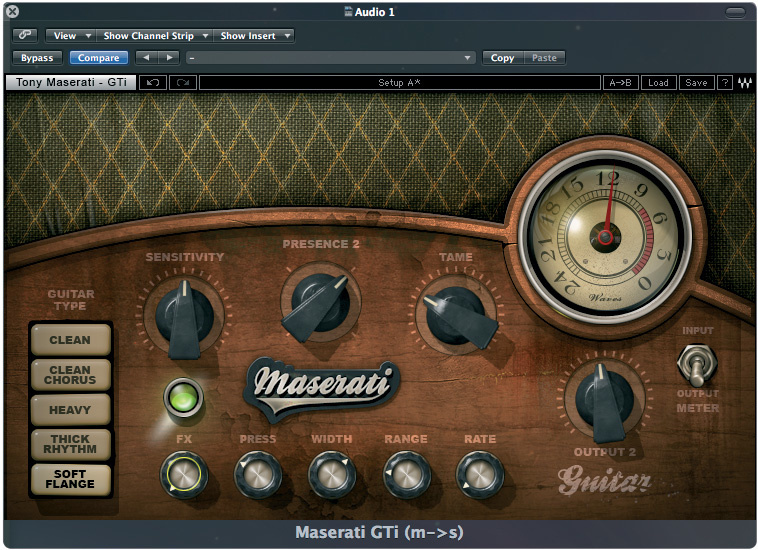 There's no clue as to what original hardware components are emulated in any of the plug‑ins or processing modes, but then that doesn't really matter: this suite of plug‑ins should be judged on its results. While stripping the controls down to a bare minimum may rob the more advanced user of some flexibility, the idea is that the sense of instant gratification you get as soon as you switch them into the signal path should more than make up for this. 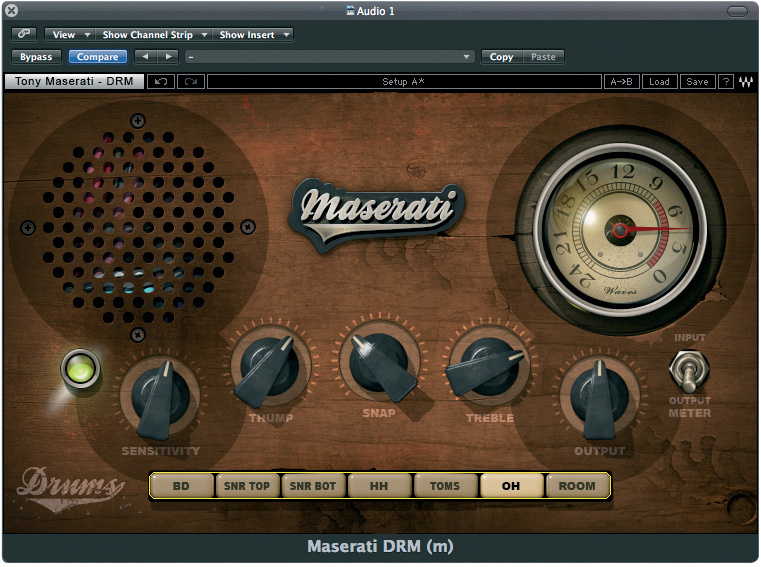 Running in native mode on both Macs and PCs, the Maserati Collection supports the native VST, AU, RTAS and Audio Suite plug‑in formats — there are no TDM versions. Protection is via iLok. 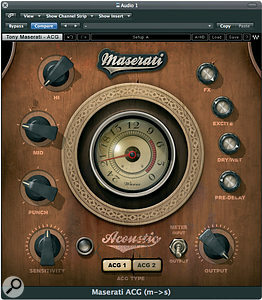 The load and save format is the same as with other Waves plug‑ins, as is the ability to create and compare A and B versions, but there are no factory presets as such. Mono‑in, stereo‑out and stereo‑in, stereo‑out versions of each plug‑in are available. First up is the GTi Guitar Toner, which is a dedicated tool for polishing electric guitar sounds. The source guitar sounds can range from clean to overdriven, and the plug‑in can also be used to add colour and movement to electric pianos. The main thing to understand about this plug‑in is that it doesn't do guitar amp modelling or overdrive — it's there to allow you to polish the sound once you've recorded it, and this it does very well. 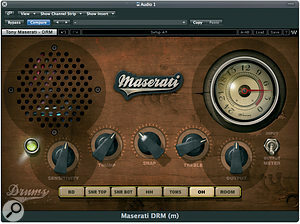 GTi offers five modes, named Clean, Clean Chorus, Heavy, Thick Rhythm and Soft Flange. As with the other plug‑ins in the collection, some of the controls change as you switch modes, but the Sensitivity control is ever‑present. This is accompanied by a three‑colour signal light to help you optimise the input level (necessary for any dynamic effects to work correctly), a round retro meter that can monitor either the input or output level, and an output level control. If you can get the lamp showing amber but not red during louder sections you're pretty much set to go, though you can occasionally get desirable effects by running the plug‑in slightly hot or slightly cold. All modes have Presence controls and all except Thick Rhythm have compression adjustment in the form of the Tame knob. In Thick Rhythm mode this is greyed out, while the FX section grows a second Presence control. 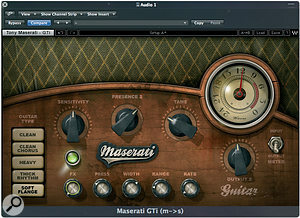 The same control paradigm extends right through this range of plug‑ins; some controls are greyed out when not used in a particular mode, while some of the others change function. The individual effects within GTi are controlled via the smaller knobs at the bottom of the screen, which adapt to the types of effect being added. For example, in Thick Rhythm mode you get to control the delay time, stereo width, vibrato and chorus on or off. There's always an FX level control to adjust the signal sent to the effects section. In this mode, even with all the effects turned to minimum, there's a very subtle tremolo effect when the FX knob is turned clockwise, while the Vibrato knob, when turned up, gives a shimmering, almost rotary‑speaker‑style modulation. Clean mode adds no obvious effects but allows a useful degree of tonal change, as well as applying some dynamic processing, and, like all the mode settings, seems to include a low‑level expander or gate to keep pauses clean. All the other settings are quite obviously effected, but in a way that sounds good right out of the box. There's scope for adjustment, of course, but the overall effect is very slick‑sounding. Thick Rhythm, for instance, includes a very plausible doubling effect when you crank up the delay time (which is limited to a short slap‑back). It may not suit all guitar sounds or all songs, but in most instances it will help you make a good guitar sound even better, and if you want to go all‑out on the chorus or vibrato effects, you can. With all of these plug‑ins, whenever you switch to a different mode you get the default factory setting, after which you can make your own adjustments. Everybody wants to create the perfect 'produced' vocal sound, but that involves having mastery over compression, EQ and reverb. The VX1 Vocal Enhancer makes all of this manageable using just a few intuitive controls, and with three 'contour' modes to suite different song styles. Contour 1 creates the impression of a small, intimate space, while Contour 2 conjures up a larger chamber that works well with slow ballads. Contour 3 is designed for faster tempos where a ballad setting might be too messy, and combines a very small room with pre‑delay. Compression is built in and in modes 1 and 2, once the input level is optimised, there's nothing else to adjust other than the compression amount knob. The EQ section comprises simply Bass and Treble optimised for vocals, while FX controls the amount of signal sent to the effect section. DLY adjusts the delay time, DLY Mix sets how much delay is added and Decay sets the reverb length. The reverb tonality can be tweaked using the VRB knob. In Contour 3 mode you also get to adjust the amount of 'air' or high boost in the sound, usually in the 10 to 12 kHz region, at the expense of adjustable compression. 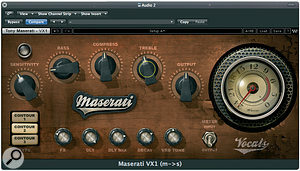 Again, this plug‑in saves a lot of work combining other plug‑ins, and makes vocals sound more even and more present in the mix. The delay is pretty conventional, while the reverb is quite rich in reflections, which really reinforce the vocal while not muddying the mix. The resulting sound is pretty contemporary, but there's enough scope to get a more obvious reverb if it suits the song. I like the way this plug‑in brightens and focuses vocals without making them seem hard or edgy, and it really pushes them to the front of a mix. Definitely one of my favourites! Rather than offering a single treatment for a drum mix, the DRM Drum Slammer has seven switchable modes that optimise its operation for the kick drum, snare top, snare bottom, hi‑hats, toms, overhead and room mics. Part of its aim is to help percussive transients cut through mixes and it can be used with live drums or any sampled drum instrument that allows you to separate the individual kit pieces. The frequency bands have been designated Thump (Low), Snap (Mid) and Treble, and I suspect there's a lot more going on behind the scenes than simple EQ, including some carefully tailored dynamic processing. The same controls are available for each mode, but I suspect that the EQ filter shapes are fine‑tuned for each application, which makes adjustment pretty foolproof. There's no adjustment of compression, though some dynamic processing is clearly happening, as the ring of the decaying drum hits lasts noticeably longer than when the plug‑in is bypassed. All the EQ controls work well, though Snap is sometimes quite subtle, but in the main the plug‑in makes drum sounds brighter and more present. Indeed, you have to be careful not to overdo things on well‑sampled kits, or you can push the sound too far forward in the mix. Obviously, you get the best results by processing separate drum tracks or instruments with multiple outputs; you can process a stereo kit mix using the Overhead or room setting, though the results are far less controllable. 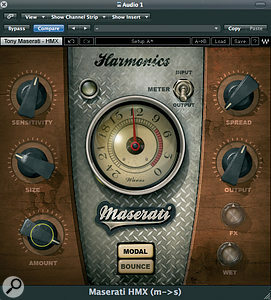 As with the other plug‑ins in this suite, the Tony Maserati HMX Harmonics Generator is far more than just a harmonic enhancer. In Modal mode it widens the apparent stereo image and adds a subtle chorus effect that works well on pianos or even vocals, not unlike a Roland Dimension D. Bounce mode adds a touch of reverb and delay, so this is a good general‑purpose plug‑in for making sources sound more lush and interesting. Size sets the perceived spaciousness, Amount controls the amount of added reverb, and Spread adjusts the stereo spreading effect. The effects can also be tempo‑sync'ed in Bounce mode. In fact, the harmonic enhancement effect seems quite subtle compared to the other treatments, adding a hint of air to the upper registers of most sounds. In combination with the effects, it can add interest and definition to pianos, synth pads and so on, and it also works with voice and guitar. A good plug‑in to try when you feel a sound is lacking something but you're not quite sure what! The B72 plug‑in has two modes of operation, one optimised for bass guitar and the other for synth bass, and it is worth trying both settings on any bass source, as you occasionally get very workable results by picking the 'wrong' mode. The Type switch toggles between the two bass types, and once the sensitivity is optimised, you get a very intuitive set of Bass and Treble tone controls that work in conjunction with a preset style of compression. Switching to Synth mode gives you the same controls plus FX input and output level controls, along with a dedicated tone control that works on the 'buzzy' part of the synth's spectrum. Using this plug‑in, it is easy to make a DI'd bass sit well in a mix. The sound becomes fuller and less gritty at the top end, while the behind‑the‑scenes compression evens up the sound and adds further weight to the notes. In Synth mode the FX tone control seems to work as some kind of sweep equaliser, but I could also detect a very subtle chorus or doubling effect that created the effect of gentle pulse‑width modulation. Whatever is going on, it adds character to the upper harmonics of a synth bass sound, while the EQ and other 'invisible' processing makes the bass end seem even fatter: very straightforward and seriously effective. Acoustic guitars can be difficult to get sounding right in a mix, so the ACG Acoustic Guitar Designer provides a straightforward toolkit comprising tonal control, ambience effects and some under‑the‑hood compression. Once again, there are two settings: ACG 1 enables the user to maximise level and tweak the high and low tonal contours, while ACG 2 is similar but more compressed. The EQ section is split into Hi, Mid and Punch bands, with switched rather than continuously variable settings. An Excite function appears to add high‑frequency harmonics to the effect chain, Pre‑delay does as expected, and there's also some kind of built‑in room ambience that sits the guitar nicely in a track without making it sound messy. ACG doesn't hide all of the piezo 'quack' from less‑than‑perfect under‑saddle pickups, but it does a pretty good job, while at the same time adding a lovely ambience and scope for basic tonal tweaking; the tone controls seem ideally placed to address the body tone and string zing of the instrument. Using the exciter can add brightness to an otherwise dullish instrument, and the compression seems to be set up just right for the acoustic guitar in the two modes. The driest of acoustic guitar recordings comes to life with this plug‑in, and a few basic adjustments soon get it sitting correctly in the mix. I love the idea behind these plug‑ins, and because the user still has a great deal of adjustment available I don't really consider them to be dumbing down music production: rather, they're a means of giving you the taste of a professional producer's signature style. Each does a specific job, and extremely well. Vocal Processor is my favourite, as it makes achieving a really professional vocal sound relatively easy, and of course you can use other plug‑ins in combination with it if you need something more specialised. Perhaps more tweaky users would have enjoyed an 'under the hood' mode with more controls that could be opened only when needed, but on balance I think the format that's been adopted will be welcomed by most recording musicians, and it's only a matter of time before competing plug‑in designers latch onto the idea. You do need a fairly brisk computer to use these plug‑ins, as each hides multiple processing blocks behind its simple exterior and each has its own demands on processing power, but then most modern DAWs have a freeze function to save on CPU power if you need it. 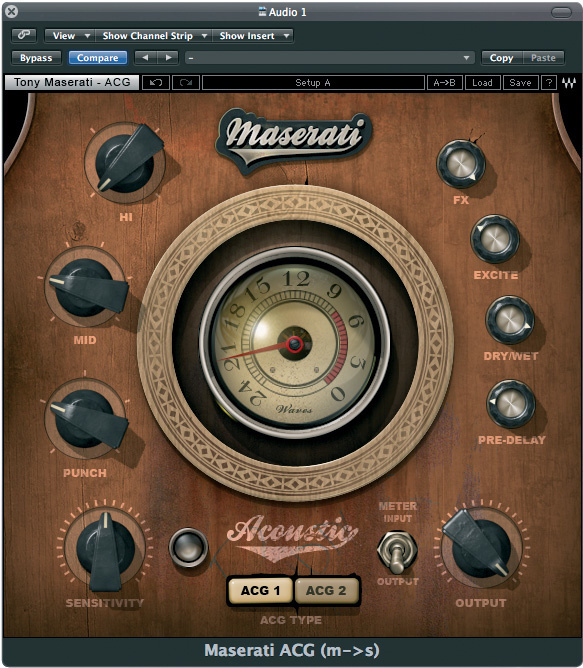 The bottom line is that I really like the results from these Waves Maserati plug‑ins and I think they'll become firm favourites in my own studio. 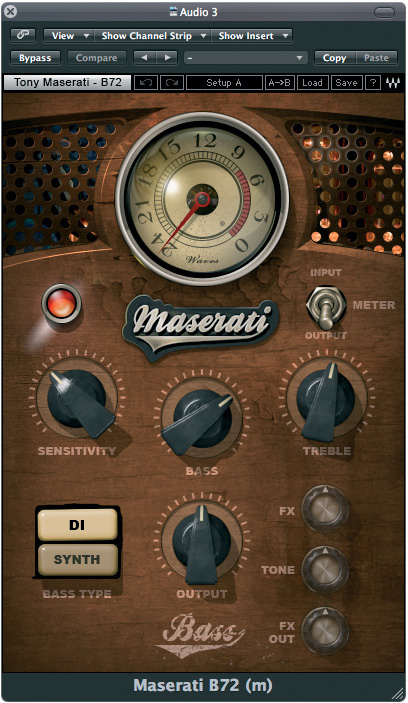 You could hire Tony Maserati to sit in on your mixes, or get enough experience to combine individual processors as effectively as he does, but if you want an out‑of‑the‑box solution that you can afford, the Waves Maserati Collection is really the only game of its kind in town. 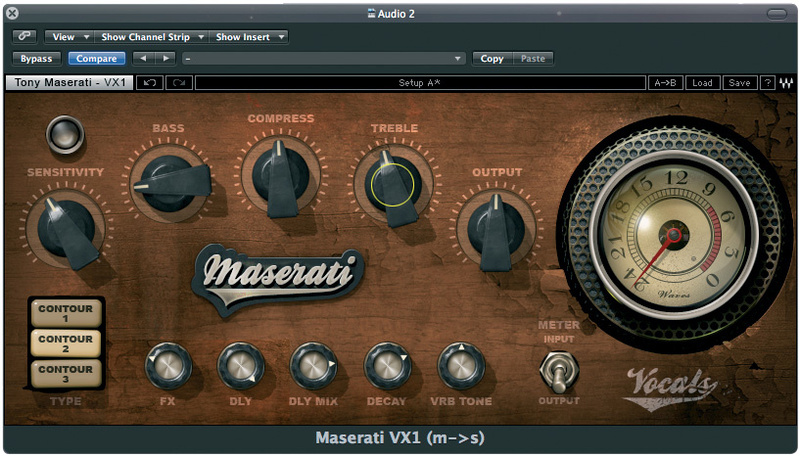 Enough adjustment on offer to avoid the plug‑ins becoming one‑trick ponies. Tweakers may lament the lack of additional control in some areas. I'm sure we'll see more signature series plug‑ins from Waves, because this first showing is seriously impressive and a great way for those with limited mixing experience to achieve better‑sounding results. Waves +1 865 909 9200.